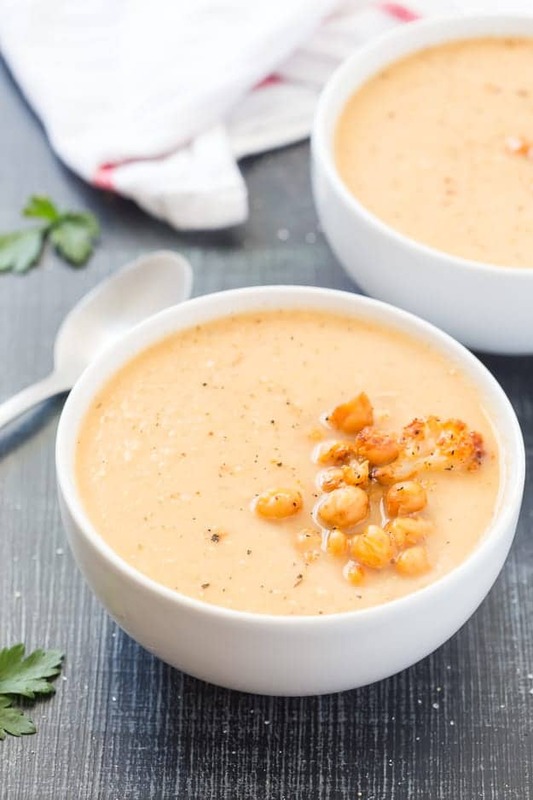 Roasted Cauliflower Soup with Chickpeas is creamy, healthier, and packed with a ton of flavor! Ready in 30 minutes! PIN IT TO YOUR SOUP BOARD ON PINTEREST TO SAVE IT FOR LATER! With the new year, we have been trying to eat a little healthier and so far it’s been working out great! As long as we have simple options and delicious meals like this Roasted Cauliflower Soup with Chickpeas, we will be okay. How are you sticking to your resolution? If your resolution is to eat a little healthier, or even their Vegolutions. Never heard of vegolution before? To me, it means incorporating more vegetables into your meals. And this soup does the trick! 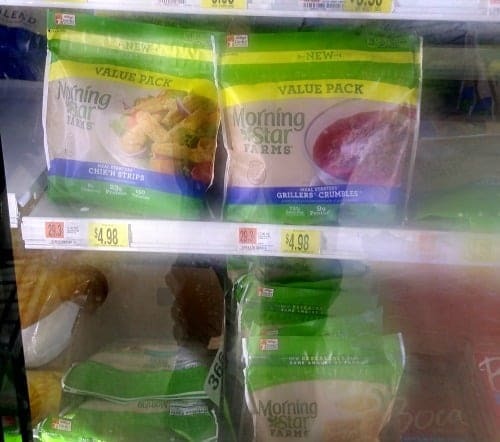 It’s completely meat-free, even down to the vegetable stock used. See even more vegolutions here. Now don’t allow that to scare you! It’s creamy, it’s right, it’s flavorful, and it’s filling. It almost reminds me of my Cauliflower Roasted Red Pepper Soup. Very similar in textures. 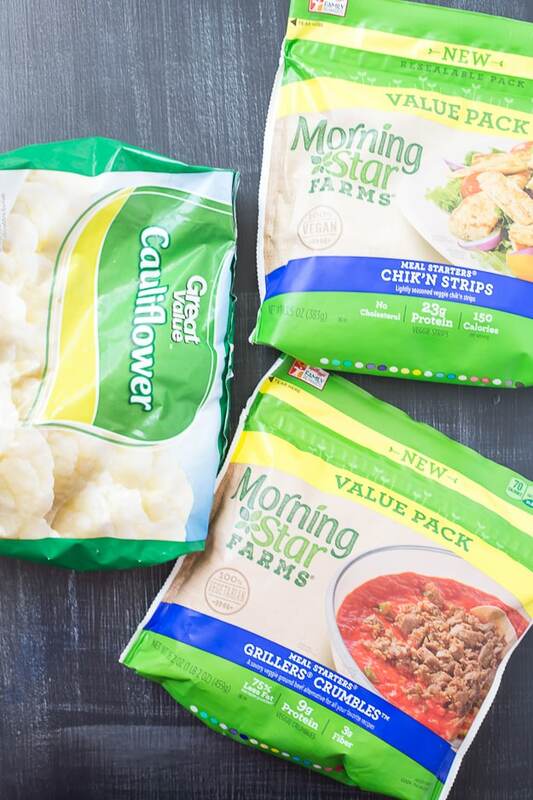 Right now you can earn $3 when you purchase any 3 MorningStar Farms® products at Walmart through January on Ibotta. If you are looking for a delicious make-ahead soup, this is perfect for you! The first day we made it it was great, but the flavors started to blend beautifully together on the second day. And to be honest, I cannot stop eating it. It’s one of those recipes I will be making at least a few times a month. 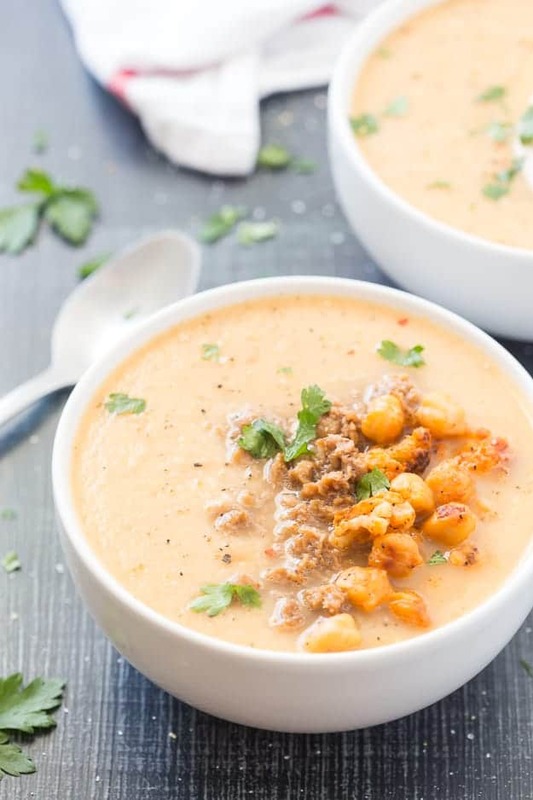 The base of this Roasted Cauliflower Soup with Chickpeas is Great Value™ Frozen Cauliflower, onions, garlic, seasonings, spices, chickpeas, MorningStar Farms® Grillers® Crumbles™ and MorningStar Farms® Meal Starters® Chik’n Strips. I decided to pair this soup with Grillers Crumbles and Chik’n Strips for a quick and straightforward meal with as-is additions. Not only does it make the soup a little more filling, but it helps to keep my family and me on our healthy lifestyle journey. 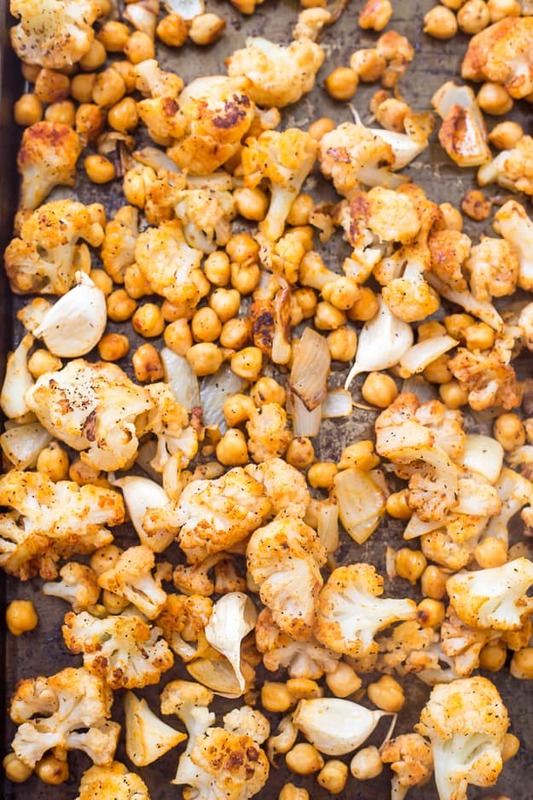 Place the cauliflower, onion, garlic, and chickpeas on a large baking sheet. Add the olive oil, salt, pepper, and paprika and toss to combine. Bake for 15-20 minutes or until lightly golden brown. Remove the chickpeas and set aside. Peel the garlic cloves once they are cool and place the vegetables into a large pot. Add the vegetable stock to the pot and allow the soup to come to a boil over medium heat. Remove from heat and blend the soup together using an immersion blender. Remove from heat and blend the soup together using an immersion blender. 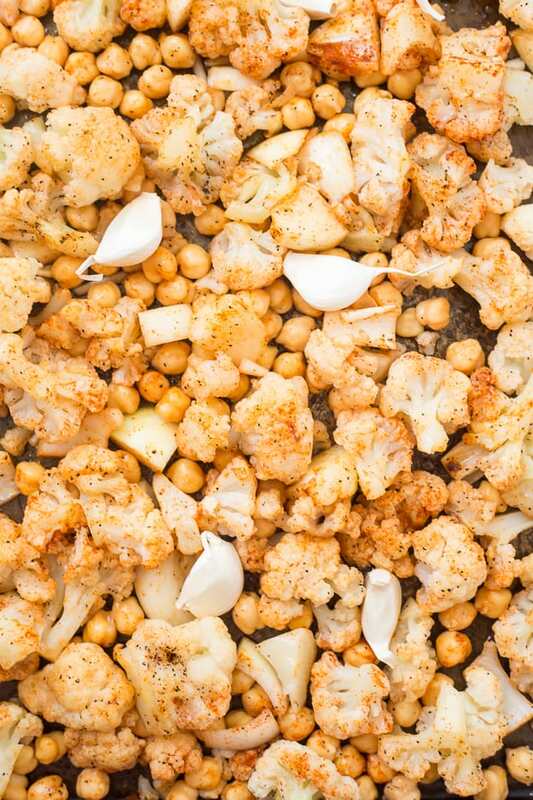 Serve in a bowl with the roasted chickpeas and the Grillers Crumbles or Chik'n Strips on top. Garnish with parsley.